EP300 is a member of the EP300/CBP family of lysine acetyltransferases (KATs) with multiple roles in development and physiology. Loss of EP300/CBP activity in humans causes a very rare congenital disorder called Rubinstein Taybi Syndrome (RSTS). The zebrafish genome has two co-orthologs of lysine acetyltransferase EP300 (KAT3B) in zebrafish viz. ep300a and ep300b. Chemical inhibition of Ep300 with C646, a competitive inhibitor and morpholino-based genetic knockdown of ep300a and ep300b cause defects in embryonic development reminiscent of the human RSTS syndrome. Remarkably, overexpression of Ep300a KAT domain results in near complete rescue of the jaw development defects, a characteristic feature of RSTS in human suggesting the dispensability of the protein-interaction and DNA-binding domains for at least some developmental roles of Ep300. We also perform a chemical screen and identify two inhibitors of deacetylases, CHIC35 and HDACi III, that can partially rescue the RSTS-like phenotypes. 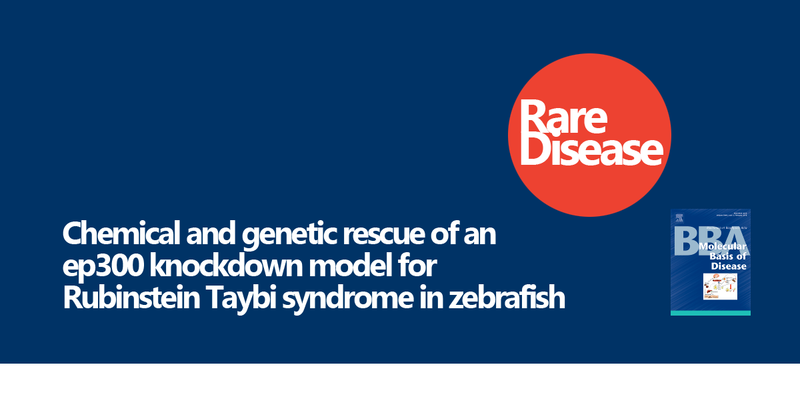 Thus, modeling rare human genetic disorders in zebrafish allows for functional understanding of the genes involved and can also yield small molecule candidates towards therapeutic goals. Babu A; Kamaraj M; Basu M; Mukherjee D; Kapoor S; Ranjan S; Swamy MM; Kaypee S; Scaria V; Kundu TK; Sachidanandan C.